On June 29, chief financial officers from trucking and logistics companies met in Chicago to discuss complex topics that ranged from mergers and acquisitions to taxes, financial reporting and business intelligence. The bottom line: being a CFO in this industry is no easy task but information systems are lightening the workload. The CFO conference was organized by McLeod Software, a provider of enterprise-wide transportation management software (TMS) for motor carriers, brokerage and logistics companies. One of the speakers, Dwight Lloyd, shared his vision to create profit-and-loss (P&L) statements for every truck and driver of PS Logistics. Lloyd noted some roadblocks in this effort, one being different cost-per-mile calculations. The company uses two types of mileage records from its transportation management system (TMS) from McLeod Software: “empty” miles for truck movements to its shippers and “loaded” miles from shippers to consignees. Analyzing tractor and driver fuel costs per mile is not as simple as dividing total gallons purchased by total dispatch miles (empty and loaded), he explained. PS Logistics also considers miles driven “outside the McLeod system,” Lloyd said, such as when PS Logistics sends drivers home on weekends. PS Logistics uses odometer or “IFTA” miles for calculating cost-per-mile of maintenance and insurance. With the different mileage definitions and a somewhat subjective method for allocating administrative costs, Lloyd said the P&Ls are a work in progress. “There are a whole stream of factors. The challenge is to come up with true numbers that make a truck profitable or not,” he said. The P&L challenge is even more complex when a company has different driver pay structures. ReedTMS Logistics pays drivers by trip, mileage and hourly in its asset division, Reed Transport Services, that operates 76 trucks. Mike Reed, president and CFO of the Tampa, Fla.-based company said he converts hourly pay to a per-mile rate to do cost analysis, but “it’s taken a lot of trials and tribulations to get to an accurate number.” When doing these and other conversions, “you’ve got to make assumptions and be consistent,” he advised. A sellers market In addition to discussing accounting strategies, speakers at the conference shared strategies and experiences to acquire transportation companies. The market continues to be very strong for sellers of asset and non-asset transportation companies but the scale has clearly tipped towards “high quality operators” in logistics, said Hugh Rabb, managing director of BB&T Capital Markets. Most transactions for logistics companies are driven by strategic buyers that want to add new products and services, he said. And it’s not unusual to see the sticker price of higher quality logistics businesses go for 7 to 8 times their EBITDA earnings. On the asset-based side, a lot of buyers pay close attention to carriers’ maintenance and capital expenditures and it’s common to see carriers selling for 4 to 6 times EBITDA, he said. Brian Barze, CFO of PS Logistics, commented on some of the acquisitions the company has made in the past few years. “When we are looking at asset deals, we focus on the culture, the people and the drivers but it’s really all about the drivers. Everyone knows how tough it is to find quality drivers,” he said. Barze and other speakers pointed out that they would not consider buying a carrier that has not already implemented electronic logs due to the investment risk. One of the recurring themes at the conference was the need to stay on top of the growing amount of operational and financial data. 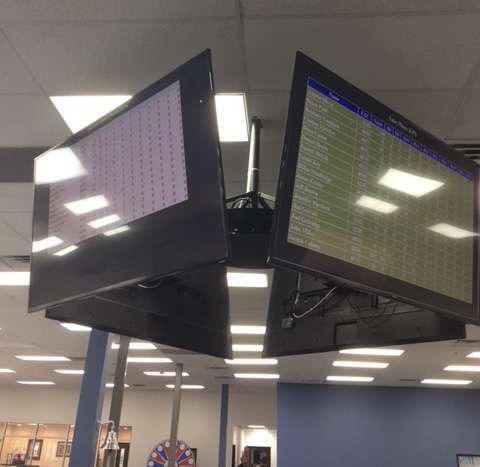 A Jumbotron in the office of ReedTMS Logistics gives everyone a real-time scorecard of performance metrics. Mike Reed, president and CFO of ReedTMS Logistics, said he organizes his fleet of 76 trucks into different groups — van, refrigerated, specialized — for reporting purposes in the company’s McLeod system. This segmentation helps him quickly focus on problem areas in each fleet such as revenue and deadhead miles. As the CFO, Reed said his most critical daily reports from the McLeod system are for unbilled loads and aging receivables. He worked with the company’s IT staff to use business intelligence tools to give other employees a range of metrics, and display them on real-time dashboards, to earn weekly pay incentives for meeting goals. ReedTMS Logistics has created dashboards for all position groups in the company from sales to accounting. In the center of the office is what Reed calls a “Jumbotron,” where the scorecard metrics rotate through four screens suspended from the ceiling. Reed also shared how the company has daily and hourly revenue and load count targets for employees to meet. Another topic of interest at McLeod’s inaugural CFO conference was detecting and preventing fraud. Marcia Wood, CFO of Choptank, a large non-asset transportation and logistics provider based in Preston, Md., said the company regularly gets emails and phone calls from people who are pretending to be carriers and requesting Comcheks. The IT department of Choptank filters incoming emails to identify who in the company is being targeted, she said. As a procedure, before anyone in its operations department can issue a cash advance via Comchek, they must call the carrier’s number listed in the SAFER system to verify that carrier actually made the request, she said. Choptank is also trying to move its vendor and carrier payments process to direct deposit (ACH) to prevent fraud. Ninety percent of its payments are now done through ACH instead of by paper checks, she said.